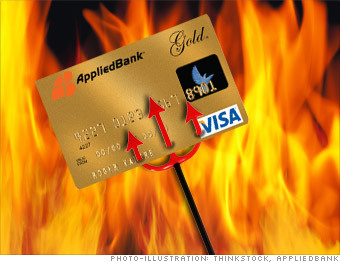 Here are 9 credit cards that industry experts told CNNMoney are among the worst in America for their sky-high interest rates and ridiculous fees. The Applied Bank Unsecured Visa Gold Card advertises a $500 line of credit and charges you an annual fee of $125 for the privilege. After the first year, that fee jumps to $180. Plus, the interest rate on the card is a high 29.99%. "Not only do they have one of the highest APRs in the business, they put a huge annual fee on it," said Curtis Arnold, founder of CardRatings.com. "About three-quarters of credit cards don't have annual fees on them, and if they do, they're nowhere near this much." On top of the high rate and fees, the issuer doesn't give customers any grace period, which is the time between the date of a statement and the date interest begins accruing. That means you pay interest immediately on any transaction you make, while other cards typically don't start charging interest for several weeks. A spokesman for Applied Bank did not respond to repeated requests for comment. Credit cards may soon be as outdated as vinyl records.